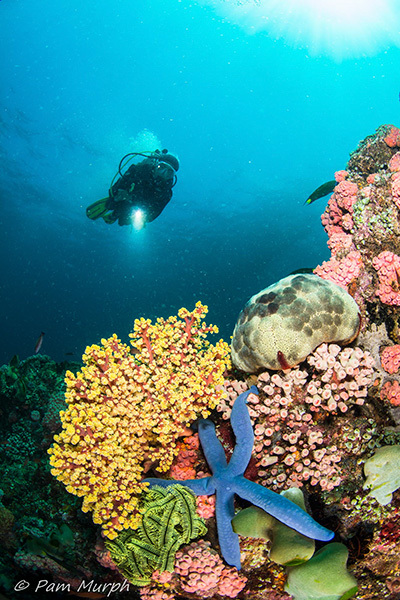 You’ve done it – finally booked that underwater photography workshop that has been on your to do list. Now all you have to do is sit back, relax and count down the days until your trip. Or, challenge your approach – get prepared, get involved and get bold – so you can get the most out of the experience. The way in which you go about getting prepared and the mindset you have about a workshop can make a world of difference. It has for me, on all the workshops I have done since 2011. After finally scheduling that first underwater workshop, I asked a key question. How can I get the most out of this? I have participated in a number of workshops since, and here is what I have learned from my own experiences and from those I have met along the way. First, get in the mindset of preparedness – in all aspects of the trip. Learn something about where you are going. Is there anything unique to the area – like Jellyfish Lake in Palau, muck diving in Anilao, or Sting Ray City in Grand Cayman. Knowing can enhance your experience and you just might want to add on a few extra days to your trip. As a first step in getting into prep mode start with some simple questions. What is the weather like, water conditions and temp? What types of plugs are used for electricity? Do I need adapters for charging camera related gear? What currency do I need? Is my passport up to date? Do I need a visa? These are just a few to start with, but many times it is easy to pass over these simple questions and steps. All steps help lead to a successful experience. Spend some time with your camera gear before the trip taking pictures and getting to know it better. I am not a full time photographer – so I can admit to not having the camera in my hands all of the time, forgetting certain settings and functions, and not always being up to speed. You may be laughing at this suggestion, but it is easy to think that we know our camera. Do not assume – get it out and play before you go. In addition, make sure you are covered by equipment insurance and DAN. Accidents do happen – to your gear and to divers. I had a “catastrophic” flood a couple of years ago, and my equipment insurance covered everything except a small deductible. Things do happen. Be prepared. Check, double check, and then triple check you gear. If you think there are too many checks, consider a recent workshop I was on in Palau. When I arrived and started putting my housing together, I discovered my housing handles were not with me. They were at home – in the USA, over 36 hours of travel time and half a continent away. That was a moment where I will admit to crying. When you consider the distance and remoteness of the location, I was not sure I would be able to overcome this missing component. Finding a store nearby with parts is hard to do in most of the locations we travel to for diving and photography. So, I got vocal and started talking to everyone around me. Lady luck was with me, and I found someone at Sam’s Tours who used my housing brand and lent me their handles for the two week duration of my trip. I admit to not following my usual prep routine for this trip which includes the three check system above. So make sure you have checked everything out before you go. And then start thinking about spares. Go prepared with spare parts, especially o-rings, batteries, sync cords, and memory cards. Go prepared with what you cannot live without. Overnight express mail is not an option. Make a check list to use when packing (which I did not use when I left my handles at home) to make sure all your gear – camera as well as scuba – goes with you. 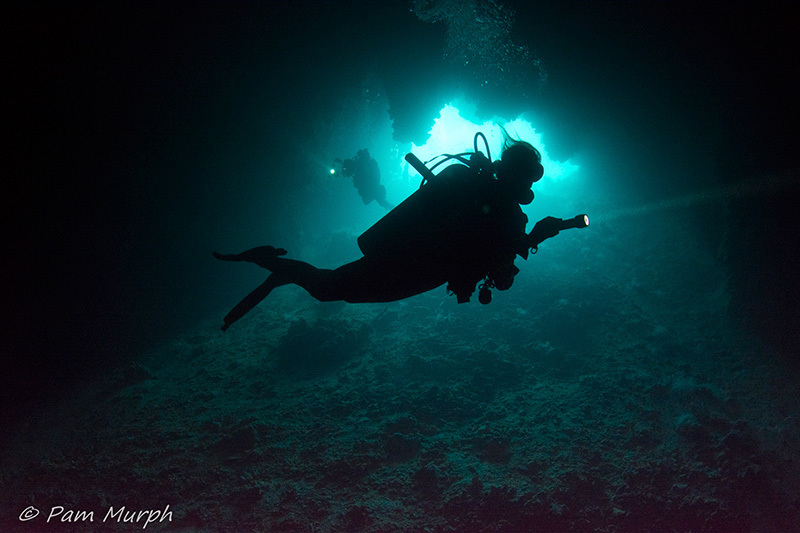 The first workshop I went on was about understanding and controlling light underwater. 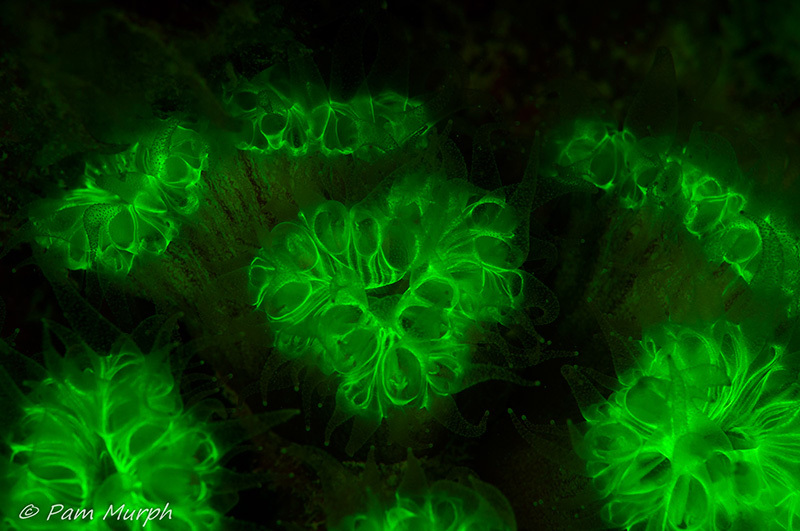 I choose this focus because understanding light is key to what we do as underwater photographers. Each workshop is different. What is the focus of the workshop that you are interested in signing up for – lighting techniques, shooting macro, big animals, wrecks, creative techniques or something else? Have an understanding before you sign up and go. It helps in preparation for the trip and enhances your enjoyment as well as your overall satisfaction. Each subsequent workshop I have participated in since that first one has had a particular focus for me like the one on new, creative techniques that I did not have previous experience with; or muck diving, or macro photography, and even ones that are destination specific such as Raja Ampat or Palau. In addition, know whether this is a photography trip, where there is no formal teaching but a well-known photographer is along for the trip; or a photo workshop where teaching occurs with lectures and photo reviews from a professional. Photo workshops are usually fairly intensive trips: three to five dives per day, being up very early or late in order to get a particular shot, changing gear between dives, downloading and sifting through files, lectures, photo reviews, preparing gear for the next day, and somewhere in there finding time to eat before falling into bed. I was told these trips are busy, but did not fully understand how busy until after the first day or two of my first workshop. Get a sense of how intensive the week is going to be. It is worth all the effort you put into. 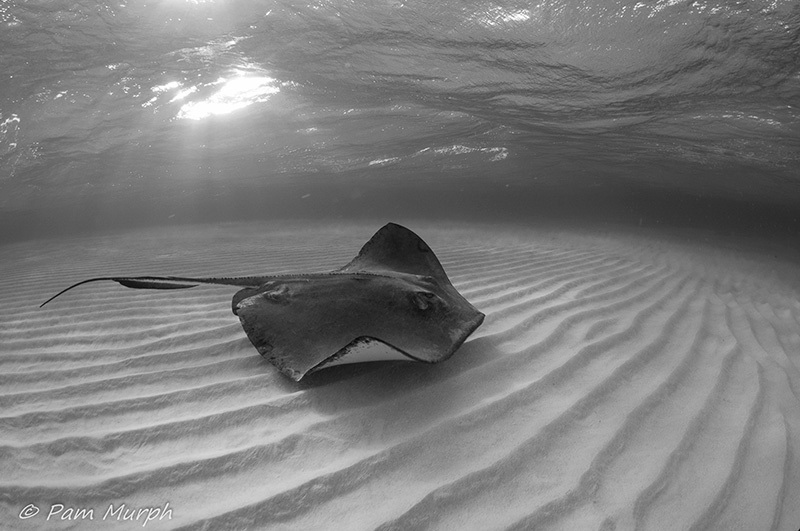 My first dawn Sting Ray City snorkel to understand light in the early morning, use magic filters, and take black and white photos produced a part of my portfolio that I could not have gotten without doing a workshop…and it was incredible! And at that time, no one else was doing this setup so I got to experience something outside the norm because of a workshop. Photo workshops are also not very conducive to family vacations because of the intensity. Think before you sign your family up to join you on one of these trips. What are your equipment needs for the workshop? This overlaps with your understanding of the focus and type of workshop you are signing up for. 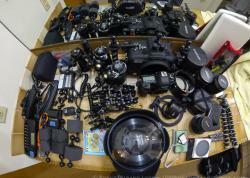 Know what lens, domes, ports, extensions, diopters, snoots, strobes, filters, scuba gear, or other equipment you need. This will make the trip a better experience for you. For example, if you are going to be doing photo reviews nightly, then having your laptop can be crucial. I take mine on all my trips so that I do not miss out on what I consider one of the most important components of a photo workshop – photo review sessions. They are extremely helpful – everyone shares a few of their shots from the day, learns from each other, gets feedback on how to improve their shot, and sees how others interpret the underwater world. 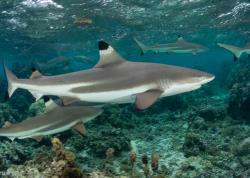 Also, the review sessions are scheduled around lectures specific to underwater photography and are not to be missed. This is your meat and potatoes of underwater photography. Ask questions, get involved and try out what they are teaching you. Then bring what you worked on underwater to the photo review session. Go out on a limb during these photo review sessions. Do not feel like you have to put up your best every time – be open - put things in that you want to improve on. For me, I go in with the notion that in order to grow and take better pictures, I need to be willing to take risks and leave my ego at the door. This is part of the challenge – getting involved and getting bold. 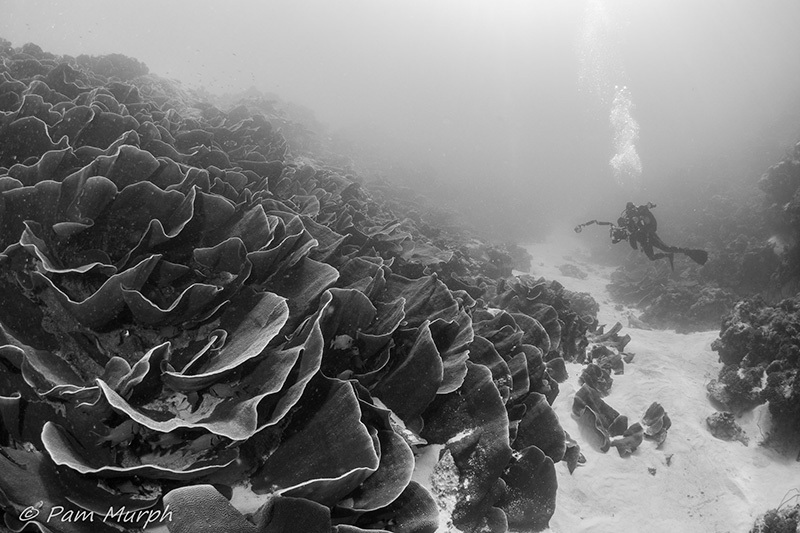 I do this often and then when we go back to the same dive site later in the week, I am able to spend more time with the subject and get a better image because of the interactions in the review session. Be a part of the process – participate. Do not be afraid to ask questions, ask for help, or acknowledge that you do not understand something that is being taught. I ask a lot of them (probably drive the leaders crazy) and take lots of notes. You are paying for the experience and knowledge of the professional leading the workshop. They have a lot to share, as do the other participants. This is a learning experience. Get as much as you can you of it and be willing to share your own knowledge with others around you. And get to know your fellow photographers. I have made some of my closest friends this way. We see each other often on other workshops and trips and even plan trips together. Challenge yourself – at all levels of the process. What are your goals for this workshop? Is there a particular type of shot you want to polish? Is there a new technique you cannot wait to try out? Are you interested in adding a model to your photography for the first time or learning how to work with models better underwater? Do you have that new snoot with you or want to have a go with new equipment? Go with the mindset of getting outside your comfort zone, learning new skills, acquiring new knowledge and improving your photography overall. I went on my first workshop trying to really hone my close focus wide-angle skills. I was having a lot of trouble with lighting the reef and dealing with ambient light in the background. By the end of the workshop, I understood how to take this shot and get the picture that I wanted. When I was getting ready for my next workshop, I read up on homemade snoots and made one to take with me. I worked in the pool the first afternoon, tried it in the ocean, and then asked for feedback and suggestions on how to improve this technique with the leader. I also took my new 105 macro lens to try out. By the end of the week, I had some shots with my lens and snoot I am really proud to show off. The end results of these workshops across the last few years (see the photos with this article) are the product of the learning process, takings shots over and over, and then trying again. I have trashed thousands of photos along the way, but I came out with many keepers too. If you want to keep everyone on your good side, do not leave your manners at home. Show up on time for the boat and briefings, and have all your equipment ready to go. There will be more camera gear than you can imagine on one of these trips. Be mindful of sharing and not hogging all of the space. 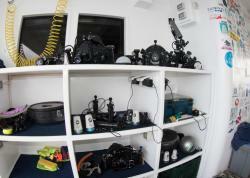 There are a lot of open housings and changing of lenses and equipment between dives. Be careful on the boat and the camera table. Also, don’t use that onboard shower to rinse off after the dive without first looking around to make sure there are no open housings or water sensitive equipment in your line of fire. Spraying without looking just might get you thrown overboard! 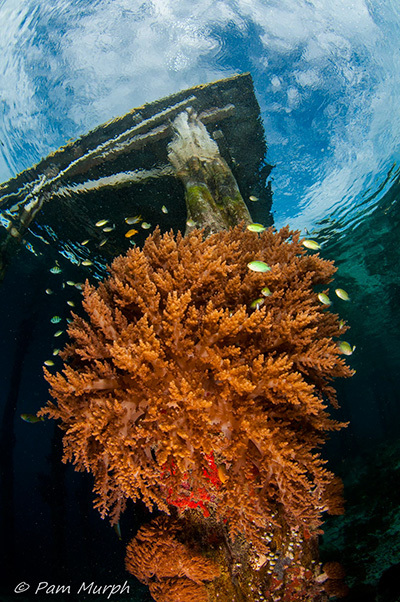 Underwater, be mindful of where you are on the reef in relationship to other photographers. If everyone is shooting wide angle, then be aware that you could easily swim into someone’s shot. Look around and down to see what is going on (there may be someone below you taking shots at an upward angle). Watch your fins, get weighted probably, and make sure you have good buoyancy. This is essential for any photography. 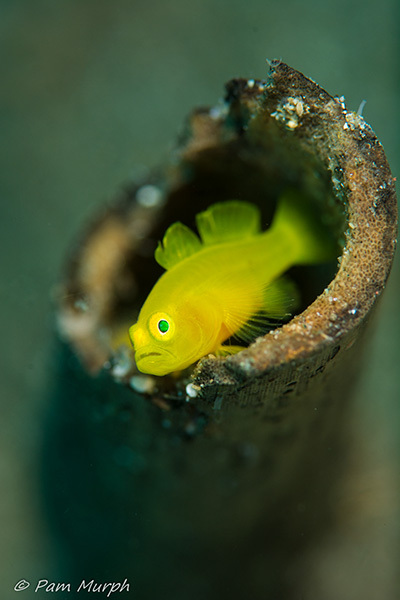 If you would like to add a model to your shots, then consider trading out with another photographer or work with a dive guide. Talk about the shot and what you would like to achieve before the dive – prepare - and then both of you can have a go at taking the shot and modeling for each other. And in shots set up for the entire group, don’t forget to share the dive guide who is modeling for everyone. Whether you are a beginner or an advanced underwater photographer, there is something to be found for everyone in a photo workshop. This is one way to take your skills to the next level. 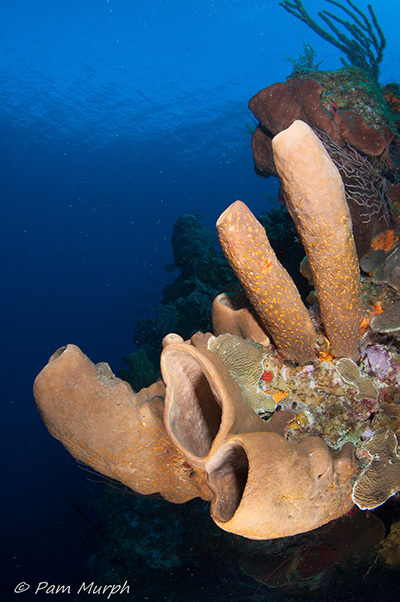 Most would agree that we are interested in learning and growing in what we do as underwater photographers. Just imagine how much better it could be by putting a little extra effort into the experience. When I finished that first workshop, I was so excited about the improvements I could see in my work and the quality of shots I brought home. 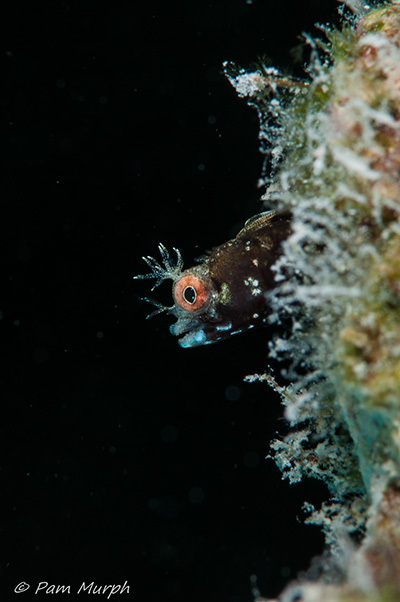 But the real test came when I shared with other underwater photographers and they could see the difference in my work. That sealed it for me. I booked another one on its heels and have continued to do so since. So my challenge to you is…get prepared, get involved and get bold. The proof will be in the experience. Hope to see you on a photography workshop in the near future…jumping right in, prepared for the experience, making a difference in your photography. Contact Bluewater Travel for available photo workshops or help you book the perfect trip.